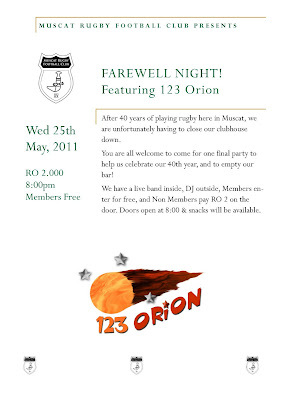 Tomorrow night from 8pm sees the farewell party at the rugby club. Come the end of the month, the club house will be closing permanently. 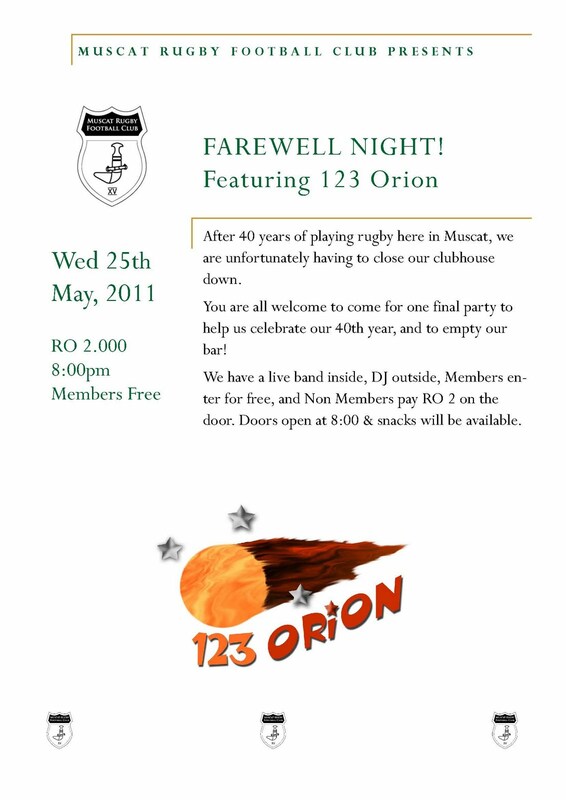 And so the rugby club are putting on one last final event to say farewell to the clubhouse. Entry is free to members, and RO 2 to non members. There will be music from local band 123 Orion and local DJ's Andy Pyzer (Local events, Previously of Oman FM and Hi FM) and Chris Fisher (host of Merge 104.8 Breakfast show launching June 7th) and you are all invited to come and help say goodbye. I thought that the Rugby Club was a gift from HM ? Would it kill you to mention that Andy Pyzer is DJ'ing, one of the most popular presenters on Oman FM and HI FM in the last 7 years and party DJ to some of the biggest events in Oman over the last 10 years and Chris Fisher, new breakfast presenter and all round great DJ on Merge 104.8 FM are also working tomorrow night at the event? Hey might help sell it a bit more mate? Sythe, I know you'll disagree, but I say good riddance to The Rugby Club. Should have been shut down years ago. Hi Suburban, always a pleasure! I'm assuming the Anon# 4 is someone who knows me in person, so next time just use your phone. The rugby club has a permit to exist from HM, and originally had land, but was moved from Wattyah to Al Khuwair some time ago. The land lord no longer wishes to permit the sale of alcohol on his land and so the clubhouse is out of a home - it is completely reasonable and the land lord was very flexible. The rugby pitch will continue for the next season, and they have a few options of where to go for the 2012-2013 season, but I guess we shall see what happens in due course. Hopefully people will turn up for this one last event to say good bye to the place.